Around Town: Community Vigil, U2 (and more), Tom Wuest, Farmers on 57th . . . The term “Overdose Crisis” has been heard throughout our cities for over a year now. With the numbers continuing to grow, our communities have been deeply affected by the trauma and loss of our friends and neighbours. In this context, a group of organizations have come together to host a Community Vigil to remember and honour those who have died in our communities. This will be a space to mourn, reflect and pray for those we have lost. The event will be held next Thursday, from 1 – 7 pm on a drop-in basis. There will be an opening ceremony at 1:30 and an interfaith memorial service at 5:30. The event is open to all people from all faiths and paths. 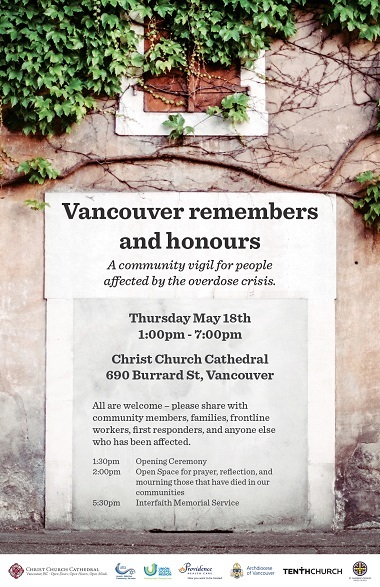 Please share this invitation and poster with community members, families, frontline workers, first responders, and anyone affected by the overdose crisis. The organizers of the event are Vancouver Aboriginal Friendship Centre Society, Christ Church Cathedral, Jewish Addiction Community Services, Providence Health Care, Union Gospel Mission, Roman Catholic Archdiocese of Vancouver, Tenth Church and St. Andrew’s-Wesley United Church. There’s quite a string of well known Christian artists coming our way over the next few days: U2 on Friday, of course, but also MercyMe tonight (May 11) at the Abbotsford Centre, Ron Kenoly May 19 at Chandos Pattision Auditorium in Surrey and Needtobreathe May 22 at the Vogue. David Taylor interviewed Bono and Eugene Peterson together last year, and discussed the Psalms at length with Bono. Amy Anderson spoke to Regent College graduate [and occasional teacher] David Taylor, who recently completed a video on the Psalms with Eugene Peterson (professor emeritus at Regent College; he developed The Message Bible paraphrase) and Bono (who probably needs no introduction). Our conversation lasted about an hour. Bono had already spent some time in the Psalms the morning of the interview, and he came quite prepared. I was impressed by his intelligent, serious care for the Psalter, and by how hospitable and relationally generous he was. It was a delightful experience (which I talk about here). Fuller [Theological Seminary] and Taylor made good on their promise and released a series of five video clips, each one featuring a different insight from our frontman. This project, Bono & David Taylor: Beyond the Psalms, is a collection of intimate conversations with Bono, who, by all accounts, is being his candid self, without pretense or persona. . . . Check out the whole set of clips on Fuller Studio’s website. Bono’s warmth and honesty will likely leave you hungry for more. Good thing that Joshua Tree 30th anniversary tour is almost here! Peter La Grand was good enough to let me know about a concert that won’t attract the same numbers as U2 or MercyMe – but will certainly be worth the effort for those who do turn out. Some will remember Tom Wuest from his years in Vancouver; he graduated from Regent College and worked at Jacob’s Well for a time, then lived on Galiano Island. But now he’s based in Ohio, so this is your chance. Grandview Calvary Baptist Church is delighted to present an evening of music with Tom Wuest May 19. The show is titled An Appalachian Home: Songs and stories of pilgrimage and place and is the official release of Tom’s new album Burn This as a Light, which will be available at the show. La Grand and other guests will join Wuest in performing songs from all his albums. Children are welcome at the concert. 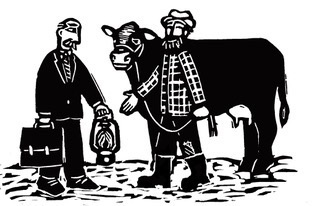 I am passing along an invitation from Karen Ageson, farmer and market garden manager for Farmers on 57th, a project of Disability Alliance BC. They began an agricultural project to transform one acre of the green space at the George Pearson Centre into community integrated gardens; the name “Farmers on 57th” comes from the location of George Pearson – just west of Cambie and 57th Avenue. 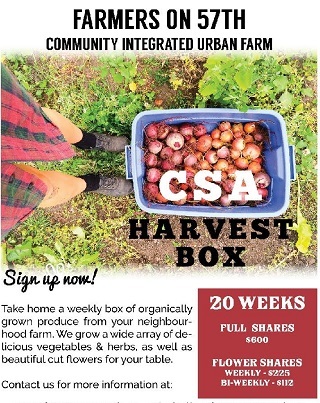 We’re looking for just six more people to start picking up weekly boxes of veggies from our Community Integrated Farm starting May 30th! Can you help spread the word amongst your community of churches? We’re looking for families interested in challenging themselves this summer to eat a veggie forward uber-local diet & help us forge a more neighbourhood scale food system. Sound interesting? Go here for more information. 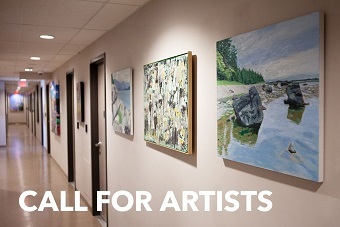 Union Gospel Mission has announced a Call for Artists for their permanent art collection on the 5th floor of their headquarters in the Downtown Eastside. The deadline is June 16. Gordon McIntyre wrote a nice piece, with a video, about Dennis Kirkley and the Vancouver Airport Chaplaincy which appeared in both The Vancouver Sun and The Province earlier this week.